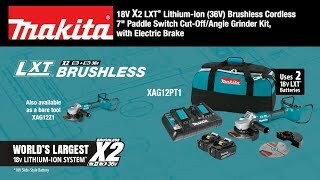 Makita, a pioneer in brushless motor technology and battery innovation, combines both in the 18V X2 LXT® (36V) Lithium-Ion Brushless 7” Paddle Switch/Angle Grinder with Electric Brake. It's powered by two 18V Lithium-Ion batteries for 36V power and performance, and has an electronically-controlled BL™ Brushless motor that matches torque and RPM to the application. 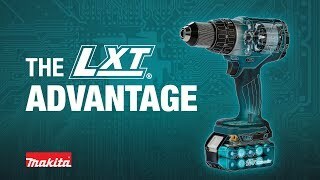 Makita 18V X2 means freedom from the cord, even for demanding applications like grinding and cut-off applications that often call for a corded grinder. 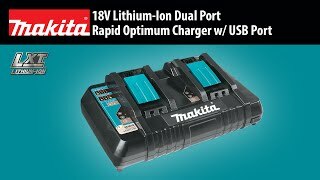 Best of all, users can remain in one battery platform, using the same fast-charging 18V batteries on the XAG12PT as they use across the Makita 18V LXT® cordless tool system. The XAG12PT is equipped with efficiency features for maximum performance. The electric brake stops the grinding or cut-off wheel in 4.5 second or less for maximum productivity, and the Electronic Torque Control turns the motor off if rotation speed suddenly slows or the wheel is forced to a stop. For consistent performance, Automatic Speed Change™ technology adjust speed and torque during operation. For added comfort the vibration absorbing back handle is isolated from the motor housing for reduced vibration, and the soft start feature suppresses start-up reaction for smoother start-ups and longer gear life. It has a no lock-on rear paddle trigger switch, and the anti-restart protection is engineered to prevent motor start-up when the battery is inserted with the switch locked on. Shipping Weight : 29.768 lbs.